Credit to images used in pin goes to Mike Mozart, UnknownNet Photography, Mike Mozart, Pip Gerard, MaxPixel – Changes were made to the original image. If there’s one place that attracts us with its rock-bottom prices, it’s the dollar store. From home organizations to functional decorations, you can find want you’re looking for. And while you might not go to the dollar store often, knowing what to buy at the dollar store will save you so much money (rather than go elsewhere). And that’s why I’ve pulled out some of the best budget-friendly things that you should always get from the dollar store. This is a list of products that you can get there so you don’t have to go to more expensive stores. So check them out and let me know what you think! If you’re planning on throwing a party soon, I highly suggest you visit the dollar store for all your party needs. They’e got you covered with plastic tablecloths, paper plates, cups, streamers, and balloons. They’re cheaper compared to buying them at your local party supply store. Seriously, there’s no reason to buy expensive greeting cards when you can get them super cheap at the dollar store. Their are plenty of designs and themes to choose from. One of the best items to stock up on are dental care products. Keeping an extra toothbrush, toothpaste, and mouthwash in your bathroom will save you money and time so you’re not running to the store the next time you run out. From pencils to sharpeners, to scotch tape, and even staplers, you can find a lot of great prices for these items. So take advantage of this and stock up on your school and office supplies. The dollar store offers bargain prices for all their hair ties, bobby pins, headbands, and anything you can find for hair accessories. Impressive right? Batteries can be a little bit pricey when bought at a local store. But not when you get them at the dollar store. So for example, an eight-pack of AA batteries typically costs $5 from home depot, but only costs $1 at a dollar store. You can find a great selection of dishware at the Dollar store. They may not always look chic, but they’re perfect if you need to replace something that broke. Whether you’re attending a baby shower or birthday party, you’ll need wrapping paper and gift bags. So try getting these supplies at the dollar store to save more money. You can find a lot of styles and designs perfect for any occasion. Another great thing that you can find at the Dollar store that’s super cheap are picture frames. Get a bunch, paint them if need be, and they’ll make a great addition to your room. Did you know that you can save a lot of money on snacks at the dollar store? Choose from a huge selection of cookies, candy, gummies, chips, and boxed chocolates. 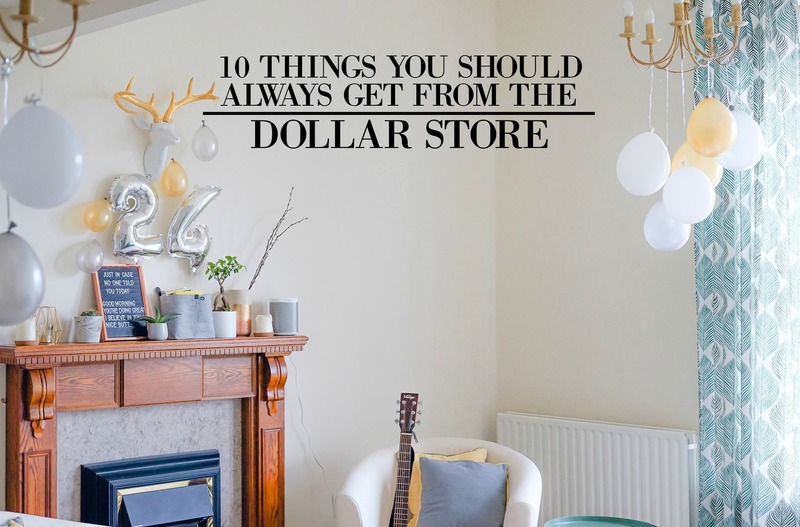 While there are plenty of awesome items that you can get from the dollar store, having this list of items you should always get there will definitely make a difference. They’ll save so much time and money and make your life easier. Now if you have any questions, let me know in the comments down below! I’d love to hear about them!